Yoogane Singapore: Celebrate Christmas with Theatrical ‘Flaming’ Chicken & Festive Log Cakes such as Matcha Sesame & Sweet Potato! 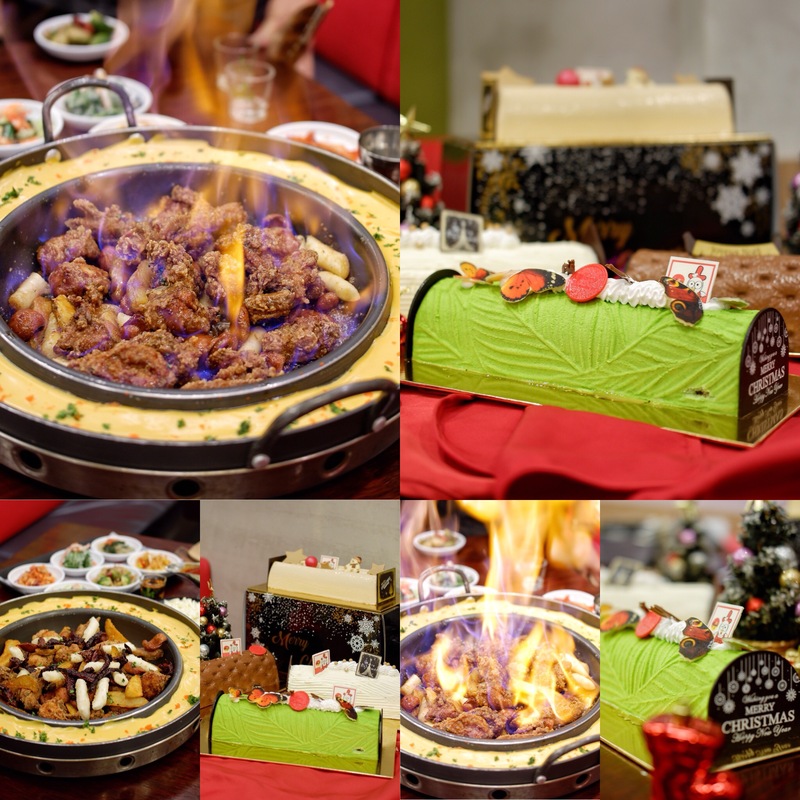 Turn up the heat this Christmas with Yoogane Singapore’s theatrical ‘Flaming’ Chicken as well as making its debut, 4 different flavoured festive log cakes. Only priced at $58++, the Flaming Chicken is a refreshing rendition of Yoogane’s signature Chicken Galbi which is stir-fried together with Chorizo Sausage, Fried Dobboki, Potato Wedges and later drenched with a choice of Galbi (spicy) or Bulgogi (non-spicy) sauce. Dip them into the rich and gooey melted Nacho Cheese for maximum pleasure! The set also comes with an assortment of addictive sides: 1) Brussels Sprout Salad with Ham, Roman Tomatoes with Balsamic Dressing, 2) Korean Bean Sprout Salad with Carrot, Leek. Chilli, Enoki Mushroom, 3) Baby Spinach, Roman Tomatoes, Whipping Cream Salad, 4) Sour and Spicy Red Cabbage Salad, 5) Crab Salad with Cucumber and Mustard Dressing and 6) Seaweed Salad with Pomegranates, Korean Glass Noodles. Remember to take out your phone to video down the spectacular ‘FIRE’ performance and yes, please bring along more people to enjoy the feast. The more the merrier! Also, for the first time, Yoogane will be launching 4 different flavoured log cakes (each priced at only $49.90): 1) Matcha Sesame Bliss, 2) Purple Sweet Potato Haven, 3) Chocolate Monkey Fun and 4) Almondy Heart. *From now till 1st December 2018, Early Birds will receive a $20 Yoogane voucher from each purchase of their Christmas log cakes. While Stocks last. So, what are you waiting for? Celebrate Christmas with Yoogane, and you’re bound to have an unforgettable Christmas this year! Psst! Enjoy a 15% off regular-priced items using the promo code: ADVOCODO 15%. This promotion is valid from now till 1st Dec 2018. Now, do you believe me when I say it’s a theatrical ‘Flaming Chicken’? Just look at the fire!!!! And of course, KOREAN FRIED CHICKEN! seasonal Watermelon Soju with the Yoogane Flaming Chicken at a special price of $29.90++ (U.P. $39.90++). Super great deal, isn’t it? Legit drink and feast to your heart’s content! 22 Dec, and last day of collection is 25 Dec 2018 and while stocks last. It’s hard to choose a favourite out of the four, and I was battling between Matcha Sesame Bliss or Purple Sweet Potato Haven, but you know what, once a Matcha fanatic, you’ll always be, and thus I’ll recommend the Matcha Sesame – great combination of Matcha flavour and Black Sesame flavour! Previous PostI LOVE YOO! : Opens New Outlet at Bustling Chinatown with Limited Edition Yoo Tiao Plushie this Weekend! Next PostViolet Oon Singapore: Opens New Retail & Restaurant Flagship at ION Orchard with Exclusive High Tea Set!